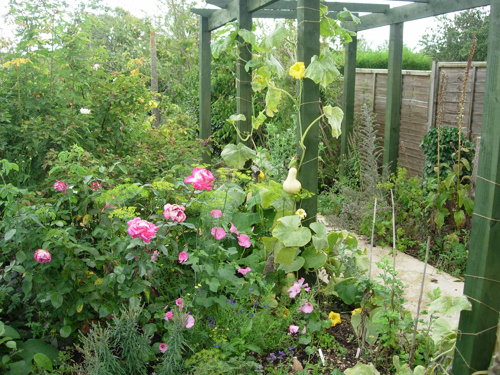 Certain climbers went in as soon as the pergola was erected, but in the main I was waiting to get the right plant or plants for each downpost. Initially we expected to have at least one climber on each downpost so that foliage and flower interest was maintained for several seasons. The intention was to add at least one Clematis to each post to intertwine with whatever other climber was there, (aiming for those Clematis that either don’t need any routine pruning, or are chopped down to a pair of buds 30cm from the ground each year). 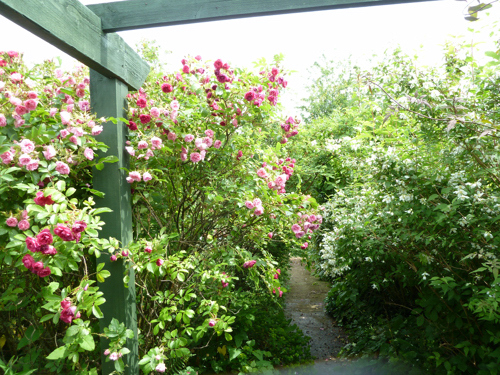 Here is a picture of the end of the pergola furthest from the house with on the left the Rosa 'Pink Grootendorst' and on the right is a Philadelphus ‘Sybille’. 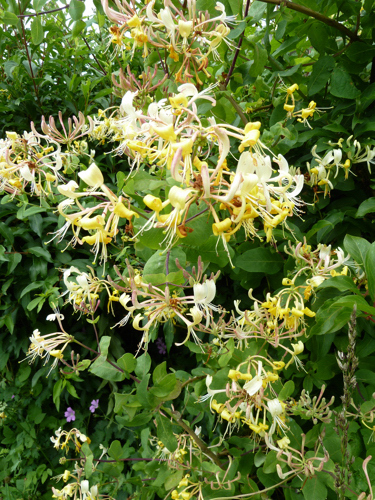 Either side of the Philadelphus ‘Sybille’ I put clumps of a yellow-flowered Epimedium from my step-mother’s garden which may be Epimedium x perralchicum. There was space between the Philadelphus and the last downpost where I planted a Jasminum officinale to carry on the white flowered scent through July, and another by the path from the rose garden. This was a plant that had done very well for us in London on clay and rioted along the fence with a Clematis ‘Nelly Moser’ and Rosa ‘Paul’s Scarlet Climber’, setting lots of seedlings as it went, two of which I dug up and brought with me here. 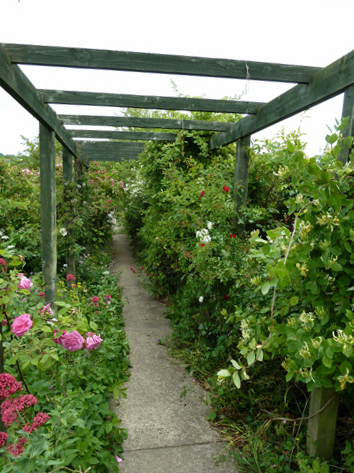 I anticipated that they would rampage round the end of the pergola from both sides to make a fragrant green tunnel at the end, with good foliage for the rest of the season. 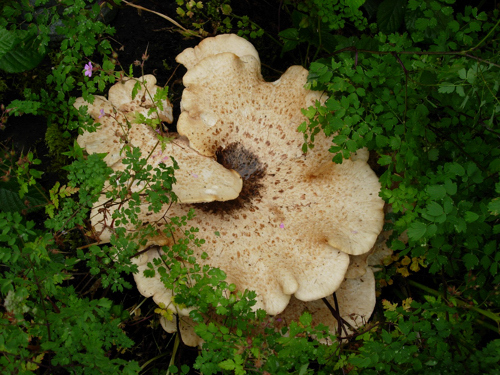 However, it is much drier here, and the ground does not hold moisture, so whilst both are ok they cannot be said to be rampaging, and are rather sedately clothing their posts but not climbing over the roof or into their neighbours. Here is the autumn foliage on the Jasminum officinale on the pergola. The border on that right hand side with the fence behind it was going to be the shady bed, ideal for woodlanders like honeysuckles which like their roots in the shade. I planted Lonicera ‘Graham Thomas’ to grow up the posts either side of the Leylandii stumps. One has grown extremely well, the other only ok, less than 3 meters apart, same growing conditions, but two different results. The excellent growing one has made a cascading pillar round its downpost from floor to ceiling too big for one person to circle it with their arms to tie it in, and it is evergreen for us here, so it is a great focal point all year. 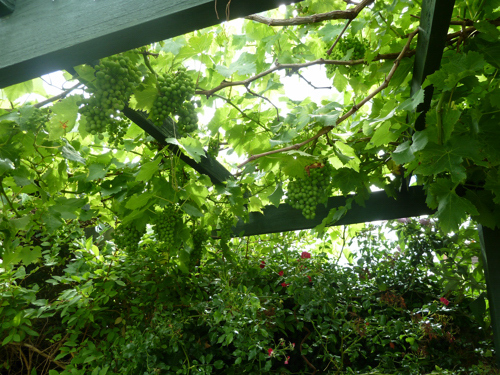 Here it is in flower on the pergola in mid-June this year. Several years later we added two other climbers on that side, a red rambling rose, Rosa ‘Rambling Rosie’, and another Honeysuckle, Lonicera Periclymenum ‘Sweet Sue’ on the nearest post on the right. Here is a shot from early June two years ago showing them in relation to the ‘Graham Thomas’, which at that time is the mass of leaves on the third post back on the right. You can see here the white rose that was already planted in the border behind the pergola on the right is just showing through, but it grows more etiolated now that it has so much competition for the light. 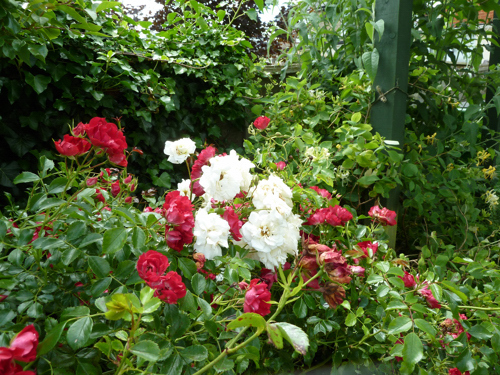 The pink rose flowering on the left is the Rosa ‘Zephirine Drouhin’ I mentioned last time. Here is a shot of the 'Rambling Rosie' in flower with the white rose intermingled at the beginning of July last year with the Lonicera peryclymenum ‘Sweet Sue’ to its right. You may also be able to see the leaves of the Buddleja davidii far right, and the common ivy (Hedera helix) behind. Looking back at old photos, the lush evergreen backdrop to the planting in the picture above is a recent phenomenon, due in no small part to the change in next door neighbours and their lack of interest in gardening, so that the ivy in their garden which used to be kept in check by the previous neighbours now is the only thing holding their fence up, and has rampaged down my side as well along the whole length of the pergola. This is threatening to overwhelm the plants I put in that border that were not designed to climb the posts. 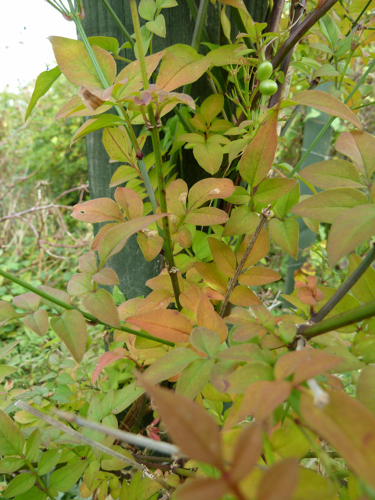 I planted Cotoneaster bullatus against the fence between several of the uprights as it has good autumn colour with its leaves turning deep red. I also planted a shrubby winter-flowering honeysuckle Lonicera x purpusii ‘Winter Beauty’ again the fence beside the white rose to give winter scent as you went down the garden. For the ground-level I put Elephants Ears (Bergenia cordifolia ‘Purpurea’) in as a shade lover; Tiarella cordifolia (dug up from my sister’s garden where it had spread happily under a big apple tree); Lamium galeobdolon - a yellow dead nettle - dug up from my mother’s garden from under her ‘John Downie’ Crab Apple tree; and several ferns. 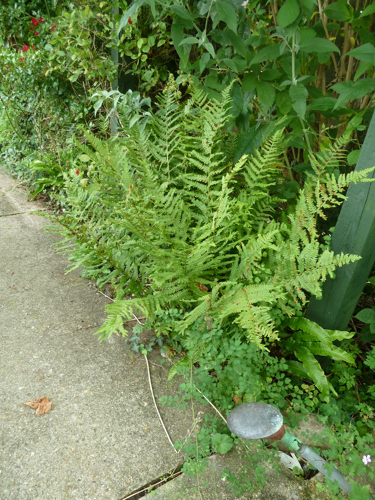 I mentioned last time that I planted Hart’s tongue Fern Asplenium scolopendrium and the Male Fern Dryopteris filix-mas round the old tree stump, but I also put some further along, together with the evergreen fern Polypodium vulgare, picture below. 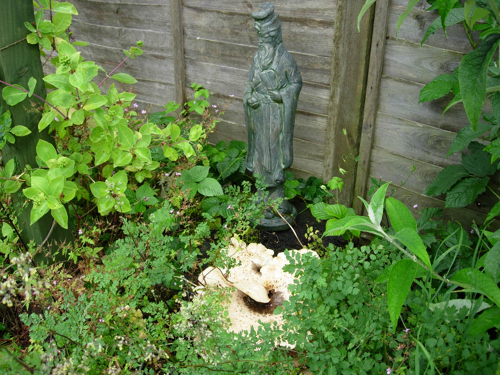 With this shot of the same part of the pergola in June 2009 you can see there was then a large bracket fungus growing on the dead tree stump, that the Lonicera peryclymenum ‘Sweet Sue’ to the left is still quite small, the Thalictrum is still in evidence, and the fence behind is still bare. 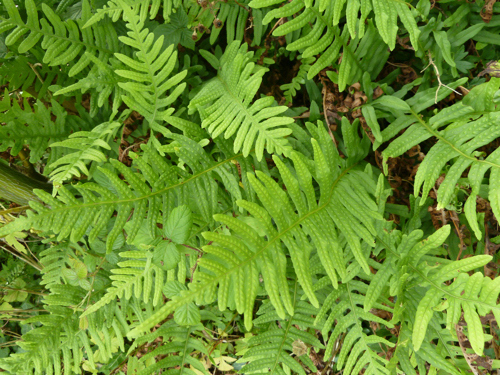 The ferns are too small to see! Although I said I wasn’t keen on the Thalictrum because it bent over too easily, it has a lovely leaf, reminiscent (to me) of a maidenhair fern, which fits in very well with the theme in this part of the bed. That first year we grew squashes up the pergola on the other side in the new thin bed, and had quite a good crop. Here is a butternut type at the end of August, waiting to ripen. 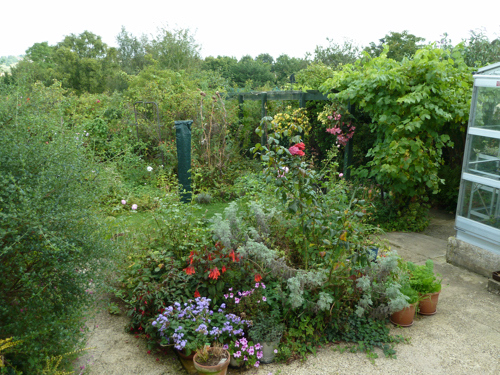 My plan was to have annual climbers grow up the posts on that side until the Rosa 'Zephirine Drouhin' grew big. Blue Morning Glory (Ipomoea tricolor ‘Heavenly Blue’) which I had got a free packet of seeds of from my Gardeners World Magazine one month, and later a pink one from a mixed colour packet of seed, and now I cannot tell for sure which colour they are going to be as the seeds I save each year have got mixed up, and I try not to mind. As I mentioned the intention was to have Clematis growing on this side. We have put in a Clematis macropetala ‘Blue Bird’ to flower in spring, and have tried (and almost completely failed) to grow my favourite Clematis ‘Purpurea Plena Elegans’ another plant that rioted away on the opposite fence to the Jasminum officinale in our London home and was just a delight. Neither of these clematis have thrived on the pergola, perhaps their roots are in too much sun on that side of the pergola. 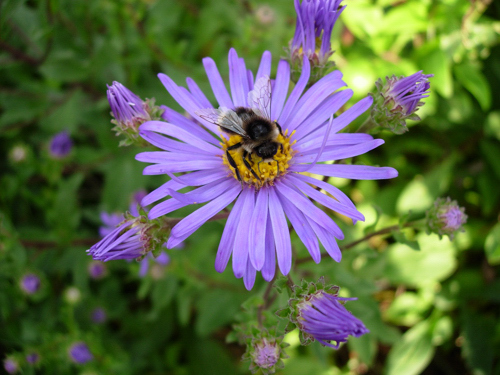 is a showy purple flower with striking gold centre, loved by bees; and Aster novae-angliae ‘Andenken an Alma Pötschke’ a serious mouthful to say but the most gorgeous cerise flowers, again with a striking gold centre, which stays upright by itself. 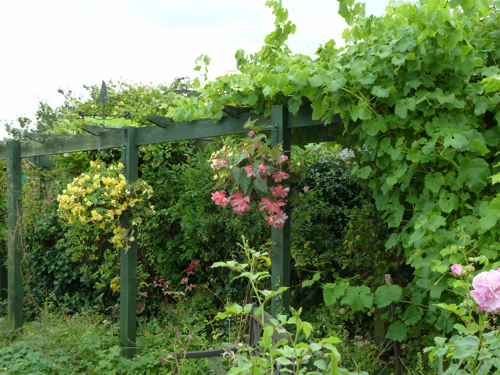 A few seasons later we put the Vitis vinifera ‘Black Hamburg’ my sister gave me in pole position on the left hand side of the pergola and it romps away. We try and train it over the pergola so that the entrance of the pergola is a “mysterious tunnel” but not over the sides too much so that you can see through the pergola to the shady side. I hope this photo from the end of July this year gives you an idea of this. This tunnel doesn’t extend more than the first couple of meters or so, as I really don’t want to be walking down a dark tunnel through the garden unable to see any of the garden, nor do I want to lose the ability to see through the pergola to the other side to give the illusion of the garden being wider than it is. From the garden, and the house, I want the central downposts on the sunny side to look like a colonnade, a feature in their own right, not merely supports for climbers. Naturally I can’t find one photo to convey this, so I hope the following photos from September last year give you a sense of it. Given that you know from the photos you saw in last month’s blog piece that there is a panelled fence less than a meter from the other side of the pergola, I think you will agree that if you see the pergola and planting now, you would not know where the garden boundaries lie, and would assume that the line of green trees you can see above the pergola that arch round to the left are all part of our garden, whilst in fact all those to the right of the whirligig/washing line are not. We have managed to borrow landscape. Next time putting paths through the rose garden. 0 Comments To "On a Chalk Hillside September 2017"